The Four Quarters, Watchtowers or Airts (pronounced eights) are the guardians of the Magick Circle, and are welcomed into your sacred space to protect, bless and witness your workings. 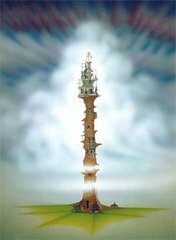 The Watchtowers represent the totality of all existence and the furthest extent of being. They correspond to the four Directions and the four Elements. From ancient times the Universe was believed to stretch outwardly toward the four Directions and to be composed inwardly of the four Elements. When we invoke the Watchtowers we symbolize our connection to all things which exist. The four Elements were believed to be the building blocks of creation. All things which exist are believed to have these four Elements within them. It has always been understood that the Elements refer not to the physical substances of air, fire, water, and earth, but to qualities represented by them. East is the Element of Air which represents thought, ideas, conceptions. It is dawn, spring, the angelic being of Raphael and the Goddess in her aspect of Maiden. The God aspect would be virginal youth. The elemental being is the Sylph. South represents the Element of Fire, noon, summer, physical manifestation, the Angelic spirit of Michael. The Goddess is in her aspect as Mother and the God is in his aspect of Father. The elemental being is the Salamander. West represents the Element of Water, twilight, fall, emotion and reaction, the Angelic Spirit of Gabriel. The Goddess and God are in their aspects of King and Queen presiding over the bounties of earth. The elemental being is the Undine. North represents the Element of Earth, midnight, winter, integration, wisdom and understanding, the Angelic spirit of Auriel. The Goddess is in her aspect as Crone. The God has descended into the Underworld. The elemental being is the Gnome. The Watchers were known in ancient Mesopotamia long before the Italians or Celts came to learn of their existence. The oldest form of the Watchers in Europe dates back to the Stellar Cults. Among the witches of southern Europe the Watchers are called the Grigori or the Old Ones. Grigori also means "Those who Watch" or "Those Who are Awake" or The Ones Who Never Sleep". They are believed to be an ancient race that has evolved beyond the need for physical form. In some legends they were said to have come from the stars. In other legends they are said to have once lived on earth in ancient Atlantis or Lemuria. In the Stellar Myths the Watchers were Gods who guarded the heavens and earth, and were demoted over the years by other Lunar and Solar Cults until eventually the Greeks reduced them to the Gods of the Four Winds. Towers as a form of worship were built bearing the symbols of the Watchers for the purpose of evocation. During the "rites of Calling" the Watchers' symbols were traced in the air with torches or wands, and the secret names of the Watchers were called out. In modern Wicca, these Ancient Beings are the Guardians of the dimensional Planes. Each of the ruling Watchers oversees a "Watchtower" which is a portal making one of the four quarters of the Ritual Circle. The Elder traditions of Wicca believe them to be ancient Gods known as the Old Ones who guard the portals to the Other World.